Plastic piping is now the preferred material in countless applications -- municipal water and sewer lines,drain/waste/vent lines, and chemical waste drainage, to mention just a few -- because plastics are durable, easy and safe to install, environmentally sound, and cost-effective. This compendium of over 40 articles is written by a professional involved in plastic fluid handling products for over 45 years. Divided into three general areas, this unique resource promotes the use of plastics in general and plastic piping systems, in particular. The articles include listings of the major advantages of plastics plus descriptions of the many varied piping products and markets served by thermoplastic piping systems. It is certain to be an eye-opener and educational tool for the experienced and novice designing and specifying engineer, installer, end-user, code official, purchasing agent, and engineering student. Provides access to the major reasons synthetically made organic chemicals (plastics) has had such a meteoric rise in usage since its inception in 1907. 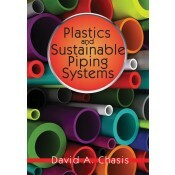 The only book encompassing articles, in one source, featuring the history of plastics coupled with background knowledge on the design, features, growth and usage of thermoplastic piping systems. Addresses Green Building in an article which documents 16 different plastic piping technologies discussed in detail and accompanied by an Appendix highlighting the features and benefits of various plastic piping materials.